Ardeth Maung Thawnghmung, The Karen Revolution in Burma: Diverse Voice, Uncertain Ends. Policy Studies 45 (Southwest Asia) Washington D.C.: East West Center, 2008. An analysis of the various types and stages of conflict that have been experienced over the six decades of armed conflict between the Karen National Union (KNU) and successive Burmese governments. David Steinberg, Burma/Myanmar: What Everyone Needs to Know. Oxford: Oxford University Press, 2013. An overview of questions and history from Precolonial influences on the continuation of Military power. R. Leach, Political Systems of Highland Burma: A Study of Kachin Social Structure. The Athlone Press: University of London, 1970. A sociological analysis applied to the rich ethnographic materials of northern Southeast Asia. James C. Scott, The Art of Not Being Governed: An Anarchist History of Upland Southeast Asia (Yale Agrarian Studies Series). Yale: Yale University, 2009. James Scott presents an important political and cultural theory; the how and why of ethnic diversity and conflict. Marie Lall, Understanding Reform in Myanmar: People and Society in the Wake of Military Rule. London: Hurst Publisher, 2016. A history of the transition, from 2005 – 2015, a valuable account of the transition. Michael W. Charney, A History of Modern Burma. Cambridge: Cambridge University Press, 2010. A general history from the colonial past to the devastation of Cyclone Nargis in 2008. Milton Osborne, The Mekong: Turbulent Past, Uncertain Future. New York: Grove Press, 2000. A compelling history of the peoples and cultures of the great river of Southeast Asia. Richard Cockett, Blood, Dreams and Gold: The Changing Face of Burma. New Haven: Yale University Press, 2015. Cockett’s insightful history, from the colonial era on, explains how Burma descended into decades of civil war and authoritarian government. Sudha Shah, The King in Exile: The Fall of the Royal Family of Burma. India: HarperCollins Publishers India, 2014. Tells the story of King Thibaw and his family from his reign to his family exiled in India. Thant Myint-U, The Making of Modern Burma. Cambridge: Cambridge University Press, 2001. A history of the country from the nineteenth to early twentieth century. The author argues that many aspects of contemporary Burmese society are the creations of the nineteenth century. Thant Myint-U, Where China Meets India: Burma and the New Crossroads of Asia. New York: Farrar, Straus and Giroux, 2012. A vivid, searching account about the remote region that suddenly became a geopolitical center of the world. William J. Topich and Keith A. Leitich, The History of Myanmar. Santa Barbara: Greenwood, 2013. Provides a detailed, historical overview of the key people, places, and events in the country’s past and present. Aung San Suu Kyi, Freedom From Fear: And Other Writings. New York: Penguin Books, 2010. Aung San Suu Kyi’s collected writings and reflections. Bertil Lintner, Land of Jade: A Journey Through Insurgent Burma. Edinburgh: Kiscadale, 1990. Describes the efforts of ethnic tribes-people to forge lives amid the larger struggles of political antagonists, drug lords, and others. Christina Fink, Living Silence of Burma: Surviving under Military Rule. New York: Zed Books Ltd, 2009. This acclaimed account gives powerful insights into the life of ordinary Burmese people. 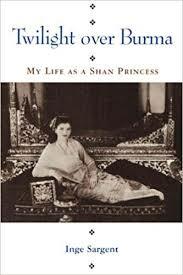 Inge Sargent, Twilight over Burma: My Life as a Shan Princess. Honolulu: University of Hawaii Press, 1994. Autobiography of the wife of the last Sawbwa (Lord) of Hsipaw; tells the story of one woman’s determination and bravery against a ruthless military regime, and the overthrow of one of Burma’s most popular local leaders. Mya Than Tint, On the Road to Mandalay. Bangkok: White Orchid Press, 2006. Stories of the lives of ordinary Burmese; from porters and sailors, fortune tellers, waitresses and artists, to petty criminals, on the road to Mandalay. Peter Popham, The Lady and the Peacock: The Life of Aung San Suu Kyi. New York: The Experiment, 2013. An insightful biography of Aung San Suu Kyi. Sao Sanda, The Moon Princess, Memories of the Shan States. Bangkok: River Books Press, 2008. Recounts both the story of her early life and shares a memoir of her father who, in 1948, became first President of the Union of Burma. Tinsa Maw-Naing and Y.M.V. Han, A Burmese Heart. Y.M.V. Han, 2015. Autobiography of the wife of U Ba Han, the personal history of one family’s journey in politics from 1930 to 2010. John Kress, The Weeping Goldsmith: Discoveries in the Secret Land of Myanmar. New York: Abbeville Press, 2009. The author’s tale of daunting travel and scientific discovery in Myanmar. Wen-Chin Chang and Eric Tagliacozzo, Burmese Lives: Ordinary Life Stories under the Burmese Regime. Oxford: Oxford University Press, 2014. The life stories of ordinary Burmese using an array of interdisciplinary approaches. The chapter by Mandy Sadan is especially recommended. Burma VJ: Reporting from a Closed Country. Directed by Anders Ostergaard. 2010. Documentary telling the story of 2007’s protests by thousands of monks. By the Time it Gets Dark. Directed by Anocha Suwichakornpong. 2017. A portrait of a beautiful country haunted by the 1976 government-sanctioned massacre of student demonstrators in Bangkok. City of Jade; and Jade Miners. Directed by Midi Z. 2016 & 2015. Two documentaries shining a light on illegal jade mining in Myanmar. Inside Burma: Land of Fear. Directed by David Munro. 1996. A 1996 Central Independent Television documentary, written and presented by John Pilger, an undercover investigation of the use of slave labor in Burma. Karaoke Girl. Directed by Visra Vichit-Vadakan. 2013. A compelling look at the life of a karaoke girl in Bangkok, where poverty, gender and desire tangle to create intractable situations. Sacrifice: The Story of Child Prostitutes from Burma. Directed by Ellen Bruno. 1999. Examines the social cultural and economic forces at work in the trafficking of Burmese girls into prostitution in Thailand. Sittwe; and This Kind of Love. Directed by Jeanne Hallacy. 2017 & 2015. Two documentaries examining human rights: covering issues of refugees and labor to LGBTI rights. The Lady. Directed by Luc Besson. 2011. Dramatized story of Aung San Suu Kyi, starring Michelle Yeoh. The Road to Mandalay. Directed by Midi Z. 2016. An intensely moving film follows the ups and downs of a young Burmese-Chinese woman fleeing poverty in Myanmar to work illegally in Thailand. They Call it Myanmar: Lifting the Curtain. Directed by Robert H. Lieberman. 2012. Documentary shot clandestinely over a two-year period, featuring Aung San Suu Kyi. ”Episode 1.” Burma with Simon Reeve. BBC Two. 2018. Television. “Myanmar’s Cycle of Debt.” 101 East Al Jazeera. 2018. YouTube. Portrays rural migrants in a desperate struggle for daily income turning to loan sharks, trapped in a cycle of debt. “Ethnic cleansing, human tragedy and the future few saw coming for Burma.” Whose Century Is it? 2018. Podcast. Insightful interview with human rights activist Khin Ohmar. “Refugees on the Thai Burmese Border Past and Present.” Foreign Correspondents Club Thailand. 2017. YouTube. “MYANMAR (Documentary, Discovery, History).” Night & Day Production Audiovisuelle. 2015. YouTube. “Wild Burma.” The Smithsonian Channel. May 2014. Video. “Myanmar”. Anthony Bourdain, Parts Unknown. CNN. April 14, 2013. Television. Amitav Ghosh, The Glass Palace. New York: Random House, 2002. Set in Burma during the British invasion of 1885, Amitav Ghosh tells the story of Rajkumar, a poor boy lifted on the tides of political and social chaos, who goes on to create an empire in the Burmese teak forest. Amy Tan, Saving Fish from Drowning. New York: Random House, 2005. A novel about fairly neurotic American tourists who get caught up in Burma’s civil war – hilarious! Aung Zaw, The Face of Resistance: Aung San Suu Kyi and Burma’s Fight for Freedom. Chiang Mai: Mekong Press, 2013. Released in 2010 after spending fifteen of the previous twenty-one years under house arrest, many are now looking to her to lead the country. Emma Larkin, Secret Histories: Finding George Orwell in a Burmese Teashop. London: John Murray Publishers, 2005. Burma, where George Orwell worked as an official in the Imperial police force, was ruled by one of the oldest and most brutal military dictatorships in the world. Francis Wade, Myanmar’s Enemy Within: Buddhist Violence and the Making of a Muslim ‘Other’ (Asian Arguments). London: Zed Books Ltd, 2017. Explores how the manipulation of identities by the ruling elite has laid the foundations for mass violence, and how some of the most respected and articulate voices for democracy have turned on the Muslim. George Orwell, Burmese Days. USA: A Harvest Book Harcourt, Inc., 1974. Set when the British ruled in Burma, this book describes some of the corruption and imperial bigotry of the time. Jan-Philipp Sendker, The Art of Hearing Heartbeats. New York: Other Press, 2002. An inspirational love story set in Burma, spanning the decades between the 1950s and the present. Jan-Philipp Sendker, A Well-Tempered Heart. New York: Other Press, 2014. Almost ten years have passed since Julia Win came back from Burma, her father’s native country. Though she is a successful Manhattan lawyer, her private life is at a crossroads. Kyaw Zwa Moe, The Cell, Exile and the New Burma. Yangon: New Myanmar Publishing House, 2018. Tales of Myanmar’s Political Upheaval: a selection of 37 of his journalistic works, written for the Irrawaddy from 2001-17, focused on Myanmar and its people, and how they have shaped and been shaped by their country’s politics since 1988. Ma Thida-Sanchaung, The Roadmap: Suragamika. Chiang Mai: Silkworm Books, 2012. Compelling account of recent history from a great modern Burmese novelist and former political prisoner. Matthew Mullen, Pathways that Changed Myanmar. London: Zed Books Ltd, 2016. Gives voice to the stories of the ordinary Burmese citizens whose efforts were pivotal to shaping life on the margins of society. Matthew J. Walton, Buddhism, Politics and Political Thought in Myanmar. Cambridge: University Printing House, 2017. Provides a broad overview of the ways in which Buddhist ideas have influenced political thinking and politics in Myanmar and provides a conceptual framework for understanding some of the key dynamics of Myanmar’s ongoing political transition. Nu Nu Yi, Smile as they Bow. New York: Hyperion, 2008. In 2007, Nu Nu Yi became the first person living in Burma to be nominated for an international literary award. Smile as they Bow was censored for more than twelve years by the Burmese government. Pascal Khoo Thwe, From the Land of Green Ghosts: A Burmese Odyssey. New York: HarperCollins, 2003. Reflections of a young Padaung student who left Burma in 1988. Beautifully written story of life in one of Myanmar’s remote areas. Patricia W. Elliott, The White Umbrella: A Woman’s Struggle for Freedom in Burma. Bangkok: Friends Books, 2006. Suspenseful and intensely moving true tale of modern Burma told through the life story of Sao Hearn Hkam: Princess, Mahadevi, First Lady, Member of Parliament, rebel leader, and refugee. Rosalind Russell, Burma’s Spring: Real Lives in Turbulent Times. London: River Books, 2015. Burma’s Spring documents the struggles of ordinary people made extraordinary by circumstance. San San Nwet (Thayarwaddy), Ma Thida (Sanchaung), Min Ko Naing, Nay Phone Latt, Han Sann, Maung Saungkha. Edited by Phyu Phyu Thi, Matt Schissler, Matthew J Walton, Of Peaceful Days. Yangon: Myanmar ICT for DevelopmentOrganization, 2018. An insightful collection of remembrances gathered across Myanmar looking at how people of diverse religions made lives together. Thant Myint-U, The River of Lost Footsteps: A Personal History of Burma. New York: Farrar, Straus and Giroux, 2008. Thant Myint-U tells the story of modern Burma, and his own family, in an interwoven lyrical narrative. Wendy Law-Yone, Golden Parasol: A Daughter’s Memoir of Burma. London: Chatto & Windus, 2013. Wendy’s story of her father, written in the backdrop of the current changes, provides great insight into how cosmopolitan and forward-looking Burma was in the 1950s. Wendy Law-Yone, Irrawaddy Tango. Illinois: Northwestern University Press, 2003. In a novel that spans five decades, a tango-dancing Asian beauty rises from her close-knit village life and impulsively marries a powerful military man, who will become her country’s dictator. Wendy Law-Yone, Road to Wanting: Sometimes the Hardest Journey is the Road Home. London: Vintage Books, 2011. Road to Wanting: Sometimes the Hardest Journey is the Road Home, Na Ga struggles to find her way.